I’m a pretty lucky gal, my husband is a sommelier and there is no shortage of great wine in our house but for many people, knowing what to bring to a party or serve to a crowd can be a bit daunting. So I asked our “resident somm” to share a few tips for selecting wine this holiday season. Let me assure you, he is not one of those cerebral wine-types that makes you feel foolish for not knowing what “wet leather” smells like. One of his most charming qualities is how easy-going he is about the whole thing. Take his “yuck or yum” philosophy for instance — it doesn’t matter if it’s the most expensive wine on the list or the fifteen dollar bottle you bought because you liked the label. “Yuck or yum”, if you like it, then that’s all that matters. Drink what you like. If that happens to be pairing cabernet and oysters, then do it. Don’t let the sommelier or sales person tell you otherwise. A favorite in this camp is Scar of the Sea. 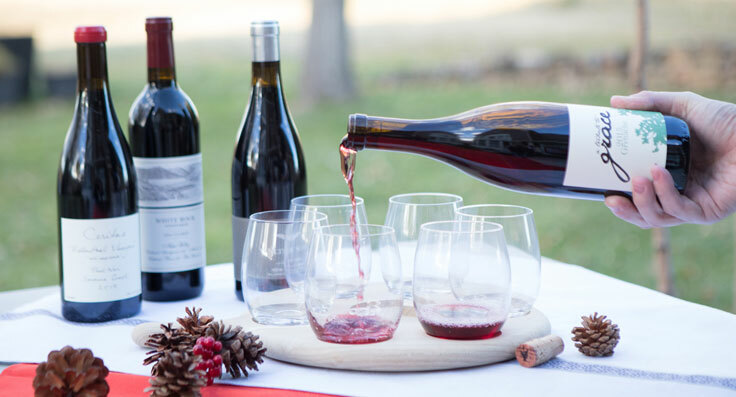 The Santa Barbara County Pinot Noir and Chardonnay are balanced and fruit driven with very little oak…and at $29/bottle, they won’t break the bank. Sparkling wine always makes a party feel more festive, especially in larger formats. They serve a crowd and let’s face it, they’re fun. You’d certainly be my favorite guest if you brought a magnum to the party! You can usually find great Cava (sparkling wine from Spain) in magnums for a reasonable price. If you’re aiming to impress, you can never go wrong with Champagne, it’s considered the best for a reason. Grower/producer Champagnes are a great choice as they are small production, artisan products where the grapes are grown and the wine is made on site so you’re not paying more for the big brand name. Seek out Marie-Courtin, she makes small production champagne that will impress the wine-geeks but also please a crowd. When it comes to pairing wine with food, there are two approaches: contrasting rich food with lean, dry wines or matching the richness of the meal with a rich, robust wine. In the contrasting camp, consider an aromatic white like Chenin Blanc. It is brighter and more acidic and will cut through a rich holiday meal. Some exceptional Loire Valley producers are Francois Chidaine and Thibaud Boudignon. In the complimentary camp, Cabernet is king. Consider Ultraviolet, a small Napa Valley producer that fits the bill in terms of balance, a touch of oak, fruit forward and simply goes down easy. And for $20/bottle so does the price. If you’re looking to spend a bit more, Le Pich Cabernet Sauvignon retails for $55/bottle. Le Pich is the secondary label of Purlieu Winery, which has received great press…so you’re basically getting the same fruit, from the same winery, just under a lesser-known brand. If you’re simply looking for that versatile, balanced, elegant wine that just shouts, “this is the one”, it’s A Tribute to Grace. This Grenache from the Santa Barbara Highlands has notes of savory herbs to match every dish or is simply great on its own. And to that, all we can add is…Cheers!